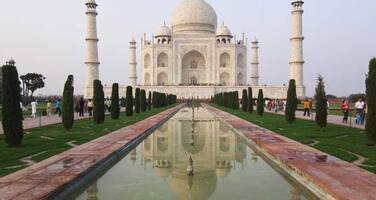 Development project negatively impacting the World Heritage value of the properties of Taj Mahal and Agra Fort (‘Taj Heritage Corridor Project’). The project was suspended by the Indian authorities in 2004. No progress report has been received from the State Party, as requested by the Committee at its 31st session (Christchurch, 2007). In August 2009, the World Heritage Centre received written and photographic information concerning the construction of a new bridge over the Yamuna River in the vicinity of the Taj Mahal, which might impact adversely on the Taj Mahal and the Agra Fort World Heritage properties. In accordance with Paragraph 172 of the Operational Guidelines, in December 2009 the World Heritage Centre requested the State Party to provide the World Heritage Centre with comments on the information received and, if the project was confirmed, it further requested the State Party to provide to the World Heritage Centre for review by the Advisory Bodies, detailed information about the project, together with any impact assessment studies that might have been undertaken. No response has been received from the State Party. The World Heritage Centre and the Advisory Bodies regret that no details have been provided by the State Party on the apparent proposals to construct a rope bridge near to the Taj Mahal and consider that information on whether this project is still being considered, and if so its potential impact on the Outstanding Universal Value of the property, need to be submitted as a matter of urgency to the World Heritage Centre, for review by the Advisory Bodies, before any commitment is made, in line with paragraph 172 of the Operational Guidelines. The World Heritage Centre and the Advisory Bodies also regret that no further information has been received from the State Party on progress with integrated management plans for the Taj Mahal and Agra Fort, and for Fatehpur Sikri, nor has information on boundaries for all three properties been submitted, in connection with the retrospective inventory. 7. Further requests the State Party to submit to the World Heritage Centre by 1 February 2011, a progress report on all of the above for examination by the World Heritage Committee at its 35th session in 2011.